The following 6-week training plan is designed to train specifically for the ARMY PHYSICAL FITNESS TEST (APFT). 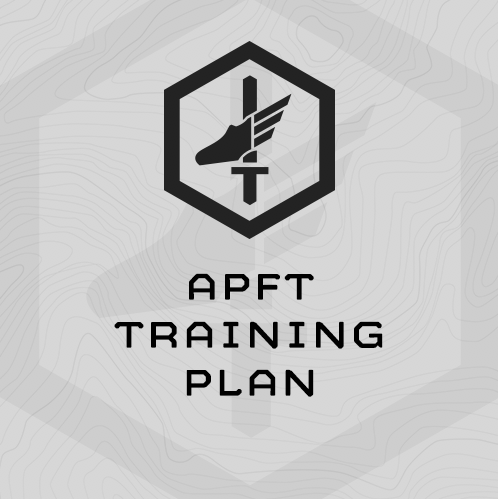 This training program deploys the APFT on the Monday of Weeks 1, 3 and 5, and uses your latest APFT event results (push up, sit up, run) for the follow-on progressions. In this way the program automatically “scales” to the incoming fitness of each individual athlete, and ensures that each athlete is pushed throughout the program. Monday, Tuesday and Thursday trainings sessions are designed to take 60 minutes. Wednesday’s sessions will be shorter – 30 minutes. Friday’s sessions include an easy, long run (4-6 miles) may take up to 90 minutes. Every other Monday you will perform 2-a-days (two sessions per day), one in the A.M. and one in the P.M.
During this program, every number of calisthenics repetitions you perform is based on the number of repetitions you completed during your last APFT in the program (Sessions 1, 11, and 21). Athlete performs 50x Push-ups on APFT No.1 (Session 1). 30% of 50x Push-ups is 15 (.3 x 50 = 15). So, a set your timer to 75 sec. On Round 1, do 15x Push-ups as fast as possible with proper form, then rest for the remaining time in the 75 sec. interval. When Round 1’s 75 sec. is up, immediately begin Round 2 by sprinting though 15x push-ups as fast as possible with proper form, again resting for the remainder of the 75 sec. interval after completing all 15 reps. Repeat this through 6 Rounds. The Sit-up progression works in the exact same way. Note: Many athletes have trouble making the final 1-2 rounds of the push up progression within the interval. If you reach failure, complete the remaining prescribed push ups on your knees. Don’t be embarrassed – this is a challenging progression and many fit, male athletes have to finish the final round or 2 on their knees. The program uses the MTI Running Calculator for your runs. These paces are based on your assessment results (again, Sessions 1, 11, and 21). Always use the latest assessment results to determine paces for subsequent training sessions. We use interval training for the 2-mile run. The intervals distances are shorter than the assessment, and the paces are faster than your assessment pace. You will perform 800m and 1-mile intervals with a rest between efforts. The pace for these intervals is faster than your assessment pace – you’ll be pushed. Can’t make the prescribed pace? Try harder. If that doesn’t work – run each as fast as possible, but still take the full rest between efforts. As soon as one event is finished, the next event must begin within 20 minutes. The Soldier is entitled to at least 10 minutes of rest in between events. All 3 events have to be completed within 2 hours. • Running area (track or other) with known 800m and 1 mile distances. Running area (track or other) with known 800m and 1 mile distances. "Mountain Tactical's APFT training plan has been incredibly rewarding so far. In 3 weeks I shaved over a minute off of my 2 mile run time and added nearly 20 reps to both my max push-ups and max sit-ups. The results speak for themselves. The app is easy to navigate and all of the workouts are laid out in a very simple, easy to understand format. I went from feeling really down on myself for my APFT score to confident that I will max it out. I will be using the "Hector" program next to work on my overall physique and performance. The fact that I can reach out at any time and get a quick response from the program coach is also a huge part of why I am so impressed with Mountain Tactical. Thank you for the awesome programs and I will be recommending you to any/all of my family or friends looking to better themselves and improve their performance." I just took my APFT after running the 6 week program. It might not sound like much, but I broke 80 points in each event. I haven't done that in almost 8 years since I've been in the national guard. I just wanted to thank you for putting together the program. This is huge for me. I can't wait to try Humility next. I used the APFT programme. After four weeks I went from 60 to 80 pushups, and 65 to 84 situps. Super pleased. 300 points after just a month. My run didn't improve (12:53) but I played sports all day the day before and that took a lot out of legs on test day. I've got an older version of the APFT plan and have used it several times over the years with solid success, and I always recommend it to soldiers in my unit struggling with their scores- I've seen it turn a couple guys careers around at the last minute. It's amazing what working up to a decent PT score can do for a soldiers morale. I'm a big fan of your programming and the methodology/mindset behind it. Keep up the incredible work! A few months ago I acquired your scalable APFT plan for and used it to prepare for a similar pt test here in Canada. I added the pullup and bench training as per your advice and it worked like a charm and kept my body weight down. I just wanted to say thanks and let you know that I find your methods and programs to be top notch, especially for those who train for results outside the gym and more specifically for combat. So thanks again, keep up the good work. I just wanted to let you know I scored a 290 on my APFT! It was my best score ever--19 points over my previous high score--and not bad for a 43 year old. Your APFT training plan was the key to my success. Thank you for your great training programs and the benefits they provide for our military members. I just took my record APFT after doing your plan and I had great results. I stopped the pushups and sit-ups early (could have done 5 more pushups and 10 more sit-ups with the time I had left) and I maxed my run for my age group. Due to family and grad school commitments I couldn't do every workout (missed 7-9 workouts total) and still maxed my PT test. I know I could have done even better if I had stuck to the plan 100%. Thanks! The only thing I didn't do was stick to your long distance run times, they seemed too slow for me. I ran an 8min pace for every run except one, and that one I ran at a 9 to 9:30 pace depending on the terrain. I hit every time progression for the sprints during the program so running faster on Wednesday didn't slow me down. Up next is cadet summer training at USMA. After I graduate I'll be a TAC officer (similar to your Company Officer at USCGA, in fact we have a Coast Guard officer in our program who is headed down there upon graduation) for a company of cadets. I bought your Ranger School program last year to get me ready for this summer (I'm already Tab'd and I found out about you during my tour as an RI). I know this is overkill for cadet training but I'm hoping to ruck circles around kids that are 8-12 years my junior. I plan on doing an unload week while we travel and will start up next week. I'll let you know how it works out. Thanks again for your great programming. I tell everyone who'll listen about MA and try to get them to see the wisdom in your methodology. had the second worst average and after six weeks we know have the highest. Thanks again and keep up the amazing programming. Rob, I just read the young mans post/question about Ranger school prep and his idea that the MILATHLETE program doesn't translate well into APFT prep. Well let me tell you he is way off base. As you know from my correspondence over the past few months my BN has been using your program in preparation for Afghanistan for nearly a year. A couple of weeks ago my commander and I had to take our APFT for record before block leave, we realized on friday we needed one and came in monday and executed, no real specific prep. I am 41 he is 43 and we both scored in the extended scale over 300. The APFT is three events it could be completed in less than 30 minutes, its a day off. Thank you very much for sending me the APFT program. I was able to get 375, which is the highest score you can get on the extended scale at West Point. I did 102 Pushups, 105 sit ups, and ran an 11:51 two mile. I got the highest score in my company. It is defiantly as a result of following your programs. Just took my APFT this past Thursday and after only two and a half weeks of your APFT workouts I scored a 290. A 20 point increase from my usual 270. Maxed both the pushups and sit-ups and cut about 40 seconds off my run time. With the Operator Sessions and those APFT workouts I should be 300+ on the next one. I just wanted to let you know that your plan worked very well for me. I maxed the APFT, shaving a minute off my run time and adding 12 push-ups and 10 sit-ups to my earlier test. Thank you for your help and coaching. I'm a hotshot firefighter here in Alaska. Myself and 19 other men on my crew travel throughout Alaska, Canada and the lower 48 fighting forest fires from April through the end of October. I'm working on changing my crew's winter PT program to something more useful to total athletic fitness (I have been following Sealfit for the last 6 months). But, standards are hard to change and the older guys in charge, as well as our "brass" don't want to stray from the classic push, pull, sit up, LSD programming of the past. That's where your APFT program can help. I'm taking one volunteer and working him through the 6 week program at the end of a scaled down Sealfit/strength cycle. I'm certain that he will not only blow the other guys out of the water come testing day, but when we get in the woods and throw down with the axes and saws as well. Admittedly I could have done more pushups and situps (after all I did 83 of each the test 2 weeks ago), but I wanted to save some for the run since I knew I wouldn't run a 13 minute... I had about 45 seconds left for pushups and 15 for situps when I stopped... I am extremely satisfied with the improvements though. Last week I finished the APFT program and want to say, first and foremost, kudos. Having been slowly recovering from an ankle injury over the last few months (I injured my ankle last spring during our Battalion Pre-Sapper course) I did have a minor drop in performance after my first APFT I took after my first month in Hawaii and first month of doing the Mountain Athlete Base Fitness Program. After that APFT I continued on the Base Fitness route on the Mountain Athlete side (more or less, with a couple of stints at using the Busy Operator 1 program for a couple weeks, introducing myself to the military side). I also hammered down on my diet a lot more too, 1x cheat day and more or less following the guidelines you guys put on the website. Once again, thanks for providing such kickass programming. This week I'm going to rest mostly before I roll right into the Operator Sessions next Monday and in October I will use the program again to see if I can't surpass this last APFT. Finished your APFT plan for the 3rd time last week; finished #1 (by raw score and points) in my unit in all 3 events on Tuesday. I’ve improved on each APFT over the last 3 I’ve taken following your program, scoring 300 each time.